Puerto Vallarta, a charming beach resort on Mexico’s Pacific Coast, also known as the Mexican Riviera, is considered by many the soul of Mexico and an ideal place, not only for a family vacation, but also for a romantic beach wedding or a honeymoon. 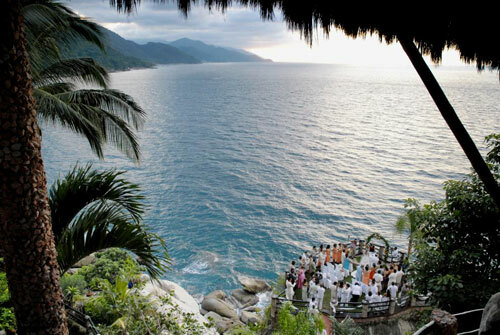 Puerto Vallarta, part of the 26 miles of coastline on the Bay of Banderas, considered among a group of the Most Beautiful Bays in the World is certainly a perfect wedding destination in Mexico. There are many interesting places in Puerto Vallarta you could visit on your honeymoon holidays. Marina Vallarta is probably one of the most attractive areas in town. Miles of beaches, various cafés and excellent restaurants await you there. The mountain range that joins the Pacific and the amazing pristine sandy beaches on the South coast of Puerto Vallarta make this spectacular scenery one of tourists’ favorite and could be the right palace for spectacular pics. Whether you are looking for a quiet romantic escape away from the crowd, or an active honeymoon, Puerto Vallarta could be the place just for you. Enjoy a romantic gourmet feast in some of the finest restaurants in Mexico, go shopping to the town’s art galleries, try swimming with dolphins, take a canopy tour and admire the view, play golf on a championship course, go scuba diving, kayaking and snorkeling. You can also enjoy horseback riding, exploring the Botanical Gardens and the local Zoo, taking a dive at Los Arcos National Marine Park or just lying on Puerto Vallarta’s sandy beaches and relaxing. No wonder Puerto Vallarta was considered the best Mexican Vacation Destination by USNews.com in 2010 and the friendliest city in the world by Condé Nast Magazine in 2003. For those who like ecotourism, the South of the bay gives you the chance to explore the forest, go wild on an all terrain car, or rappel into the many rivers you can find there. You could also visit Puerto Vallarta’s natural reserve, and admire its rich aquatic life, sea birds and fauna. Puerto Vallarta combines the beauty of the scenery with the spirit of the small fishing village it used to be. Surrounded by lush jungles and the Sierra Madre Mountains, Puerto Vallarta beaches offer visitors amazing picturesque scenery. Apart from the surroundings, one of the most important aspects to consider when planning a wedding is the resort you will stay at. It could no doubt make the difference, so that is the first thing you have to do. Think about how you want your wedding to be and then decide on the hotel. However, if you are not sure about what of Puerto Vallarta’s All inclusive Resorts would be the best choice for you, all-inclusive-weddings.com would be happy to help you. Contact us and we will guarantee you make the right decision. You could find really good special wedding packages at most of Puerto Vallarta All Inclusive resorts, but if you have thought of having a unique wedding, tell our planners what your idea is and they, will help you customize your wedding and make this special day a perfect one, just the way you have dreamed it. You can always ask our planners for more information, but if you have already decided on the hotel, move forward. Planning a wedding could take a lot of time and efforts. It requires a lot of expertise to make everything work the way you want it. All-Inclusive-Weddings.com can help you plan your destination wedding in Puerto Vallarta. Why choosing All-Inclusive-Weddings.com as your Puerto Vallarta Wedding planner? If you decide to book your rooms with All-Inclusive-Weddings.com we will take care of your Puerto Vallarta destination wedding planning for you at NO ADDITIONAL COST. We will do everything we can to guarantee you a perfect wedding in Puerto Vallarta. Why choosing All-Inclusive-Weddings.com as your Cancun Wedding planner? If you decide to book your rooms with All-Inclusive-Weddings.com we will take care of your Cancun destination wedding planning for you at NO ADDITIONAL COST. All-Inclusive-Weddings.com takes care of everything. You do not have to worry much, just relax and enjoy your wedding. However, there are still some requirements you cannot forget about. For further information on requirements for Puerto Vallarta Weddings ask our planner. Don’t worry about paper work, we will guide you and you will see than it is easier than seems. Others have done it, why not you? Good luck! Ask us to Price your Puerto Vallarta Weddings today and we’ll start the process of making your dream wedding in paradise a reality.